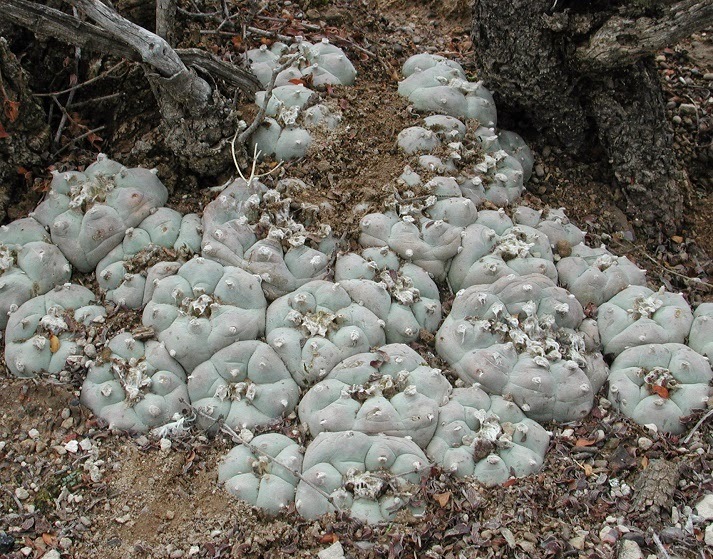 The Peyote - Lophophora williamsii, is a small, generally spineless cacti that is found primarily in the Chihuahuan desert of Mexico. They grow low to the ground and often form groups with numerous, crowded stems. Its common name comes from the Nahuatl language (known informally as modern Aztec) ' peyōtl', and is said to mean glisten or glistening. This particular species of Lophophora is well known for its psychoactive properties alkaloids, particularly mescaline, and has a long history of ritualistic and medicinal use by indigenous Americans going back to at least 5500 years! 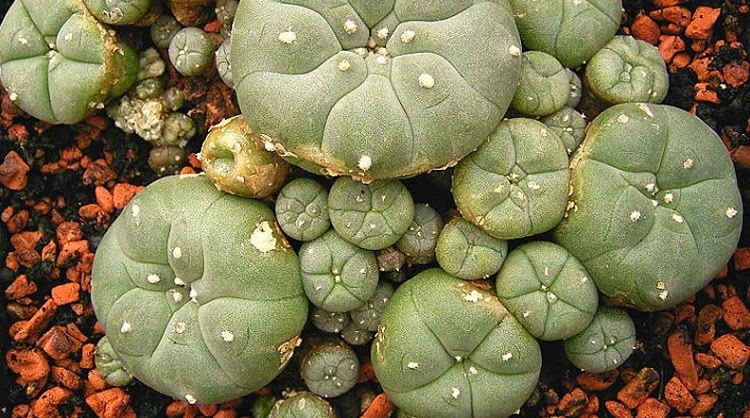 Taking peyote is reported to trigger states of deep introspection and insight and are described as producing a metaphysical or spiritual nature. The effects last between 10 to 12 hours. Some Native American tribes use Peyote for its curative properties, notably for treating such ailments as toothache, pain in childbirth, fever, breast pain, skin diseases, rheumatism, diabetes, colds, and blindness. 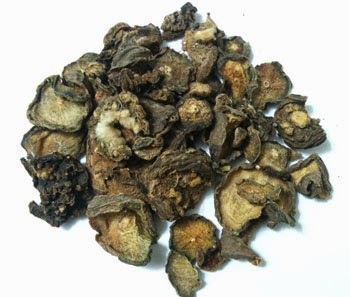 The stems contain are generally chewed, or boiled in water to produce a psychoactive tea. Sadly the stems are extremely slow growing reaching only 2 cm in 4 years in the wild! Cultivated plants will grow perhaps twice as fast but even so will still need to be approximately 10cm wide before they are worth harvesting. Remove the stem of the cactus but do not cut into the root. Firstly the roots do not contain a significant amount of psychoactive material, and by leaving a certain amount of stem the plant is usually able to produce new buds over time. Remove any spines and wash thoroughly in clean water. Peel back the skin and cut slices around the core, but do not remove the core as this part is discarded. The sections can be chewed, or ground down and added to water. They can also be frozen or dried and taken at a later date. 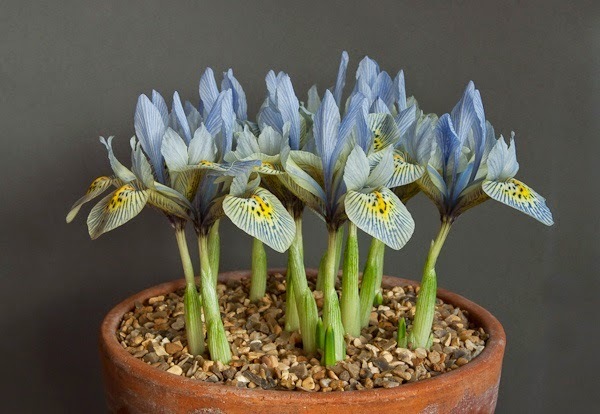 Unlike its larger cousins the rhizomatous, perennial flag and bearded irises, Iris reticulata 'Katharine Hodgkin' is an exquisite dwarf ornamental, flowering specimen that is produced from a bulb rather than a tuberous rootstock. It will grow to approximately to 12cm in height, with mid-green, narrow leaves appearing in late winter which are followed by erect flower-bearing stems in early spring Each bloom comprises of 3 large spreading or pendent petals, which are alternated by a further 3 erect, often smaller, regular petals. Considering the size of the plant the flowers are comparatively large at approximately 10 cm wide. They are a creamy, pale-blue in colour and decorated with a pattern of deeper blue veins. There is also a patch of yellow at the base of the petals which is significantly marked with small, dark-blue blotches. The leaves will noticeably elongate after flowering. To ensure a good flowering display the following spring allow the bulbs to dry out in the ground over the summer. Do not be tempted to water. 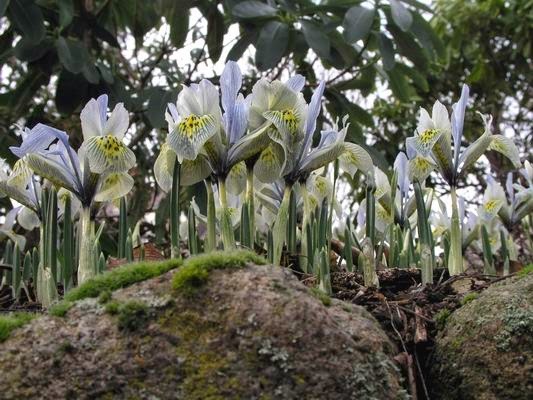 Iris reticulata 'Katharine Hodgkin' was created by amateur plant breeder Bertram Anderson in the early 1960's. It was named after the wife of fellow plant enthusiast, Eliot Hodgkin. 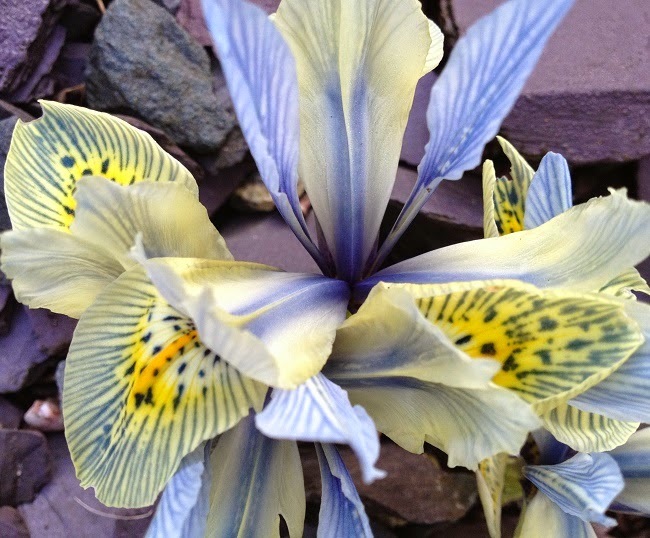 Iris 'Katharine Hodgkin' received its Award of Garden Merit from the Royal Horticultural Society in 1996. Camellias are arguably one of the most beautiful of all ornamental flowering shrubs. Native to a large area of Asia from the Himalayas and then eastwards to Japan and Indonesia, they are notable for their large, brightly coloured blooms and glossy dark-green foliage. 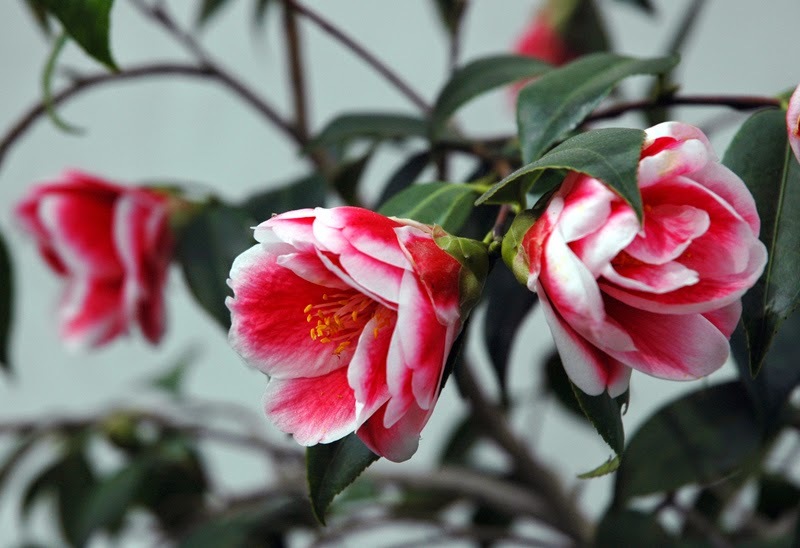 Selected forms of wild Camellias had been cultivated in the gardens of China and Japan for centuries and would have been brought to the attention of interested westerners from their representations in Chinese painted wallpapers. However the first living camellias were not seen in England until 1739. Of course Camellia cultivars are now readily available from most plant retailers and despite the relatively high prices they are surprisingly easy to look after. Regarding pruning, other than deadheading old flowers there is little to do other than removing straggly growth. Be aware that the flower buds are formed on the previous years new growth from late summer onwards so indiscriminate pruning in the autumn or early spring will result in a distinct lack of blooms for the coming year. Young plants should never require anymore than a light cutting back of the previous years growth to encourage the side shoots to grow. Even then this is only really necessary with straggly plants. Take last years new growth and reduce this in length by about a third to a half. Always cutting back to just above a leaf. WHY ARE MY CAMELLIA FLOWERS GOING BROWN? WHY ARE MY CAMELLIA LEAVES TURNING YELLOW? 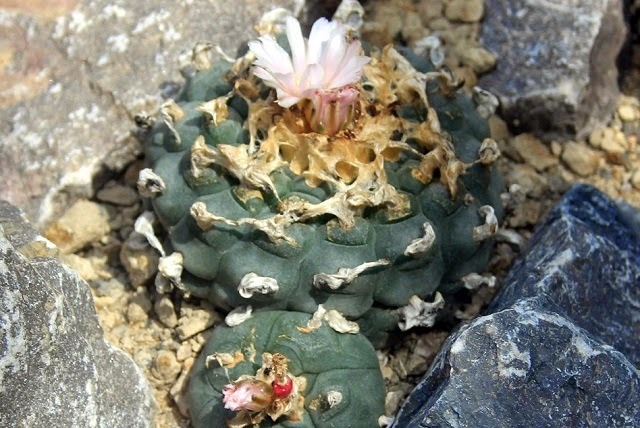 The Peyote is a small, slow-growing cactus from the desert regions of Mexico. It is a popular choice with collectors not just because of its ornamental value but also for its psychoactive properties. While slow to grow they are relatively easy to germinate from seed, just so long as you can sufficiently replicate their native habitat. They are usually found in calcareous deserts, on rocky slopes, or in dried river beds, so when making creating a suitable seed compost mix make sure that is is extremely well-drained. Consider using a 50:50 ratio by volume of John Innes seed and gritsand. The peyote has evolved in alkaline soils so avoid using a peat-based or ericaceous composts, or for that matter lime-free grits or gravels. While adult cultivated plants have a history of being susceptible to root rots if kept too wet, their seeds in the wild usually germinate during the hot September- October rainy season. So as you can imagine you will need to provide hot and humid conditions to encourage germination. 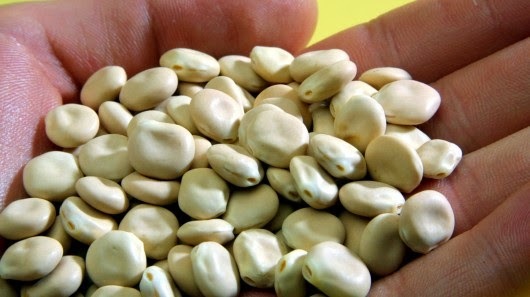 First, soak the seeds in warm water of approximately 25-30 degrees Celsius for a couple of hours. Then using a large modular seed tray (large modules not large tray) fill with the compost and tap to settle it down. Water in and allow the excess to drain away. So the seed at a rate of one seed per module. Peyote seed will need the presence of light to germinate so do not bury the seed into the compost, just press it into the surface to that it has good contact with the surface. If you like you can apply a thin layer of vermiculite onto the surface. Place the tray inside a heated temperature with the vents closed and at a temperature of between 25-35 degrees Celsius. Be aware that better germination rates will occur if you can provide lower night temperature of between 15-25 degrees Celsius. The propagator will need to be kept in a position where it will receive as much bright light as possible but avoid direct sunlight as this can overheat the seeds or dry out the compost. Alternatively you can consider using fluorescent tube lighting for approximately 16-18 hours a day. To prevent the compost from drying out and to help maintain a humid atmosphere water the compost regularly using a mist sprayer. You can expect the seeds to germinate within 2 to 14 days. Once the seeds have germinated maintain the damp, humid conditions for a further 4 weeks, after which slowly reduce the humidity by less frequent watering and from progressively opening the vents. After a few more weeks you can completely remove the lid, but still keep the soil warm and moist for a further 8 weeks. Continue to keep them in indirect sunlight but once they reach about 12 months old you can pot them on into individual pots and begin to slowly harden them off to direct sunlight. 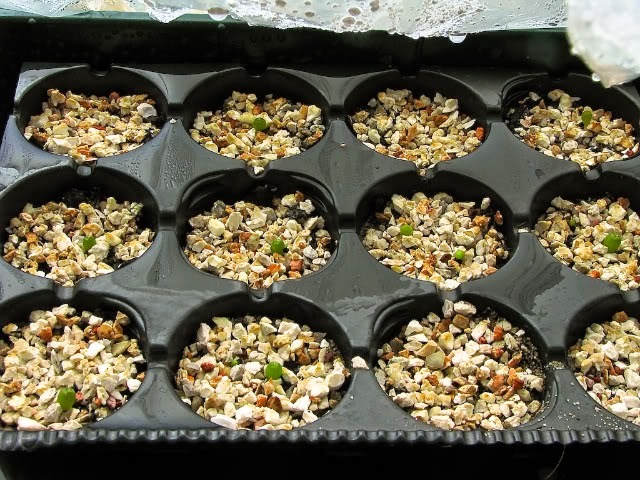 Peyote seedlings should be a healthy green colour if you have been hardened off to the appropriate light levels. If the stems start to turn a red colour then this may be an indication the the seedlings are getting too much light too quickly. If so either move the seedlings to a site with lower light levels or apply shade to the windows where they are. For the very best lupin cultivars it used to be the case that you only purchased plants that were vegetatively propagated from cuttings. Why? 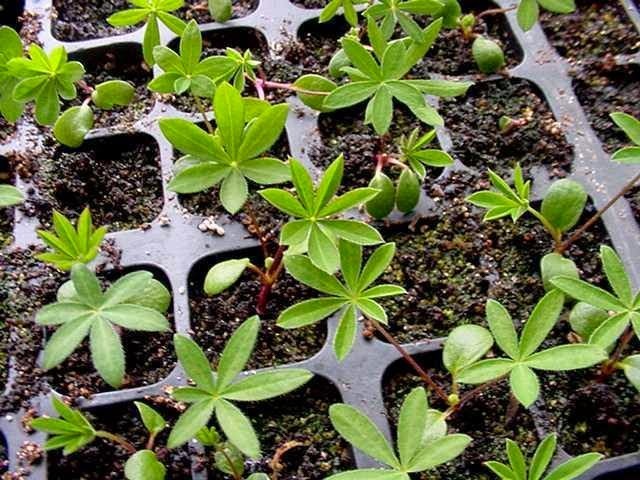 Because lupins are notorious for producing seedlings of a quality far lower than the parent plants. Furthermore they hybridize readily so the chances of ending up with seedlings that have anything like the favoured characteristics of the parent plants are remote. 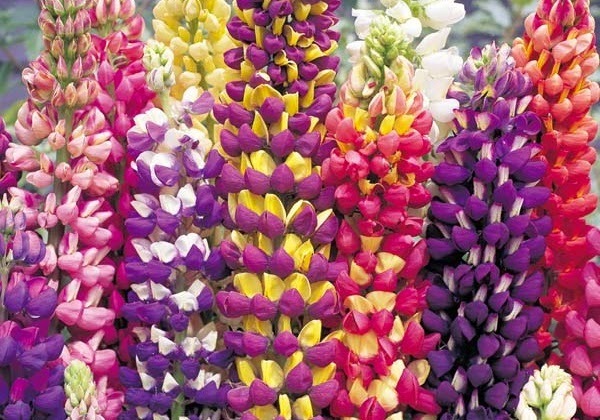 Of course nowadays we get to benefit from the hard work of those clever plant breeders who over the years have managed to produce a number of excellent seed grown cultivars, the best of which are arguably the trademarked Lupin 'Tutti Frutti' hybrids. So whether you want to grow one of the new seed-grown hybrids or are trying to produce your own lupin hybrids, growing lupins from seed is surprisingly easy. Lupins can be sown from spring until early summer and then again in the autumn. To begin with soak the seeds in warm water for 12 hours or so. Then using a large, modular seed tray filled with a good quality compost such as John Innes 'Seed and Cutting'. Gently water in and then allow the excess to drain off before pressing one seed onto the surface of each module. Do not bury the seed as it will require the presence of light to help initiate germination, However you can apply a thin layer of vermiculite approximately 3mm deep to prevent the seed from being lifted if you need to water. Place the tray inside a heated temperature at approximately 18-20 degrees Celsius or seal inside a polythene bag. Place on a warm bright windowsill, but one that is out of direct sunlight. You can expect the seedlings to emerge from 18-21 days, at which point they can be removed from their propagator or bag. Once the seedlings have established in their modules they can be popped out and potted on into 3 inch pots and then moved outside to the protection of a cold frame. Spring sown plants can be planted out into their final positions 12 inches apart in the autumn. Autumn sown plants can be planted out once the threat of late frosts have passed in late spring. Remove any flower spikes that appear in the first year as they will redirect energy reducing the plants ability to establish for the following year. While many bamboo plants are undeniably graceful and ornamental, given favorable conditions they can end up being aggressively invasive. Plant a vigorous running species in a confined area without considering the consequences and you can end up with a rampaging thug growing through ornamental borders, pristine lawns and even pathways. Cutting back the culms (canes) will clear a site but if you leave then root system unmolested then you are just building up to more problems for the future. The trouble is that the successful eradication of vigorous bamboo will take time, patience and more often than not - money! The simplest method to remove bamboo is to remove the cums and then proceed to carefully dig out the entire root system. Of course, this can be difficult with very large plants, or on heavy soil. Furthermore, any significant pieces of root that are left in the ground will eventually re-established as new plants later on. If you want to save time and energy then consider spraying your bamboo with an effective herbicide such as glyphosate. Of course the larger the plant, the more difficult it will be to completely kill it, and and you may require several applications of weed killer to succeed. Smaller plants will be relatively simple to apply a weed killer to. Taller plants with finger width culms can be bent over onto plastic sheeting and secured to the ground. They will then be ready for spraying with a reduced risk of other plants of turf becoming sprayed also. For culms thicker than your thumb it may not be possible to bend them over to ground level. In this case cut the canes to ground level and treat with a stump and root killer containing glyphosate. Treat foliage of any regrowth with another application of weedkiller and repeat on any subsequent growth. 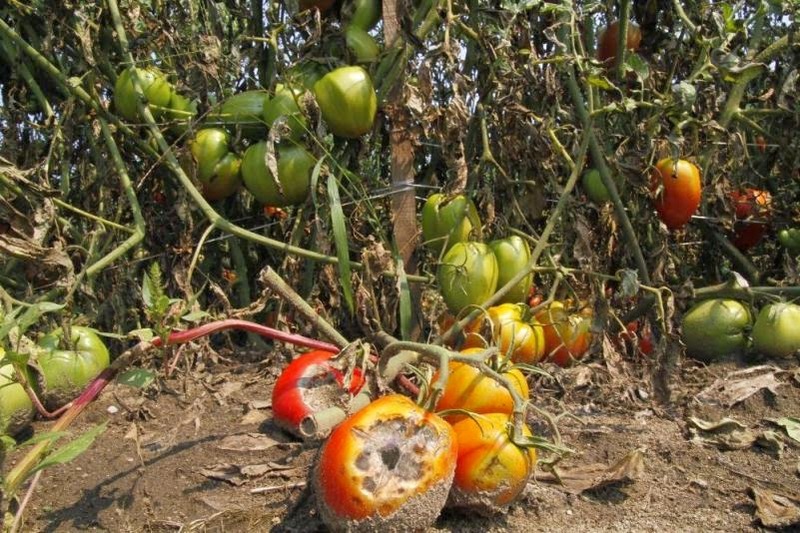 Tomato blight is one of the great curses of the modern grower, it is unsightly, quick to establish and can destroy an entire crop in just a matter of days. Unfortunately it is also difficult to control either by environmental control or fungicides. And once you have it the spores can rest in the soil, ready for another infection as soon as conditions are favourable. Recently there have been some new introductions that have performed extremely well against Late Blight. Given time - and improved availability - these hardier varieties will hopefully give tomato growers around the world a well deserved break. The three best performing varieties are listed below. This is a deliciously flavoured variety that has also trialled well in the garden situation against ‘Late Blight’ infection. In fact it has also shown good resistance to Tobacco Mosaic Virus, Verticillium, Fusarium Wilts, and nematodes too. 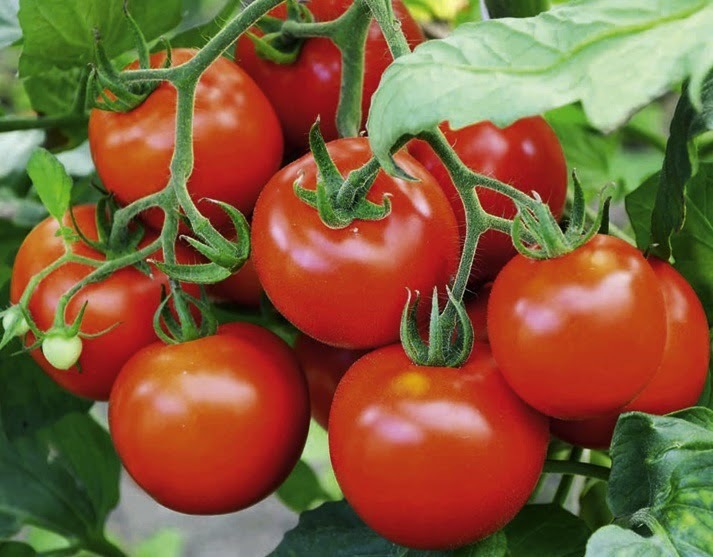 Tomato ‘Fantastico will bear you a good crop of round fruits, with each plant producing up to around 6 lbs of tomatoes. Not only has this new variety shown excellent tolerance to ‘Late Blight’, it has also proven itself to be highly resistant against both fusarium wilt and verticillium wilt. As with the new ‘Legend’ cultivar, ‘Ferline’ has also tested extremely well in garden trials. It produces heavy crops – up to 5 lbs per plant – of flavoursome, deep red fruits. Although it does well sown outdoors ‘Ferline’ is also suitable for growing under glass. This particular variety was bred in the USA by Dr. Jim Baggett at Oregon State University. In recent tests ‘Legend’ had shown impressive blight tolerance, and in particular during trials in a ‘garden’ situation. It produces large, glossy red fruits with an expected crop of up to 6 lbs per plant. The fruit have a slightly flatter shape compared to the norm and come almost completely seedless. Fortunately for most gardeners, best results are produced when the plants were grown outdoors but they are also perfectly fine for growing under glass. 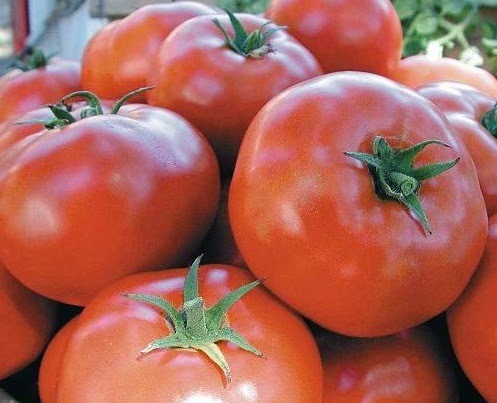 They have an excellent flavour and should be sown 6-8 weeks before expected lasts frosts - in the United Kingdom this will be anytime from March onwards. 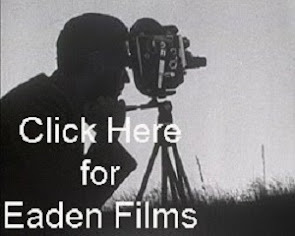 The name elephant grass conjures up images of adventure in the African grasslands, and while there is indeed a native African grass that goes by that particular common name there is also a certain amount of confusion. Why? Because two other grass species also go by the same common name. Of the three contenders Pennisetum purpureum is the only one which is a genuine native of the African continent. Also known as Napier Grass, Uganda Grass or Giant King Grass it is robust perennial grass from the Poaceae family. It is a tall plant able to grow to 2-3.5 metres high, although there are reports of it reaching up to an impressive 7.5 metres. It is clump-forming and produces robust bamboo-like clumps with large, mid-green large leaf blades (up to 120 cm long) with a prominent whitish central vein. Its flowers are borne on a dense, bristly false spike usually yellow-brown in colour, though occasionally greenish or purplish. It is popular as an animal feed crop as it will tolerate growing in poor, dry conditions. 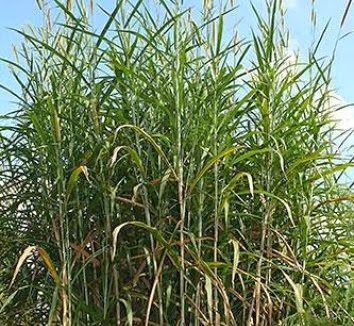 Otherwise known as Ravenna grass, Saccharum ravennae is a species of grass from the sugarcane genus. Native to southern Europe and western Asia, this particular species of elephant grass is a large, aggressive species also from the Poaceae family. It is the smallest of the three species producing erect stems up to 4 meters in height, and serrated leaves up to 1 meter long. The flowers take the form of plume-like panicle of spikelets which are covered in white or pale-colored silky hairs. It will grow best grows in moist and wet habitat such as marshes and riverbanks. Also from the Poaceae family, Miscanthus sinensis is a robust, herbaceous perennial grass native throughout most of China, Japan, Taiwan and Korea. Growing up to 2 m tall, there are reports of it growing up to 4 metres. Miscanthus sinensis forms dense clumps and is widely cultivated as an ornamental plant in temperate regions around the world. The flowers are purplish, held above the foliage. 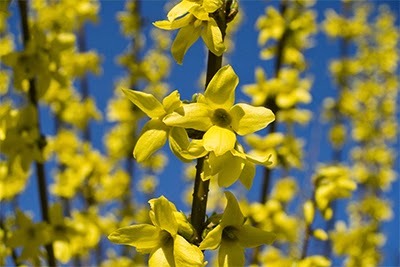 It will grow quite happily in most fertile, moist but well-drained soil in a position of full sun. It may require additional watering in sandy or free draining soils. 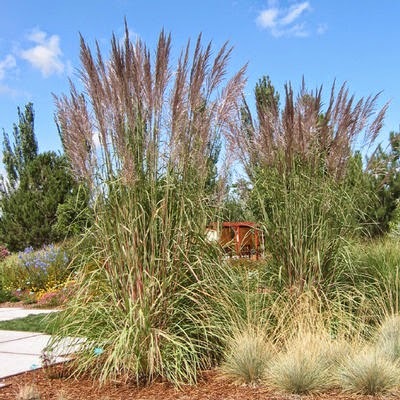 Of the three species Miscanthus sinensis is arguably the most ornamental for garden use and has a large selection of attractive cultivars to choose from. Go to any good plant retailer and you will usually find a fairly varied selection of ornamental grasses. 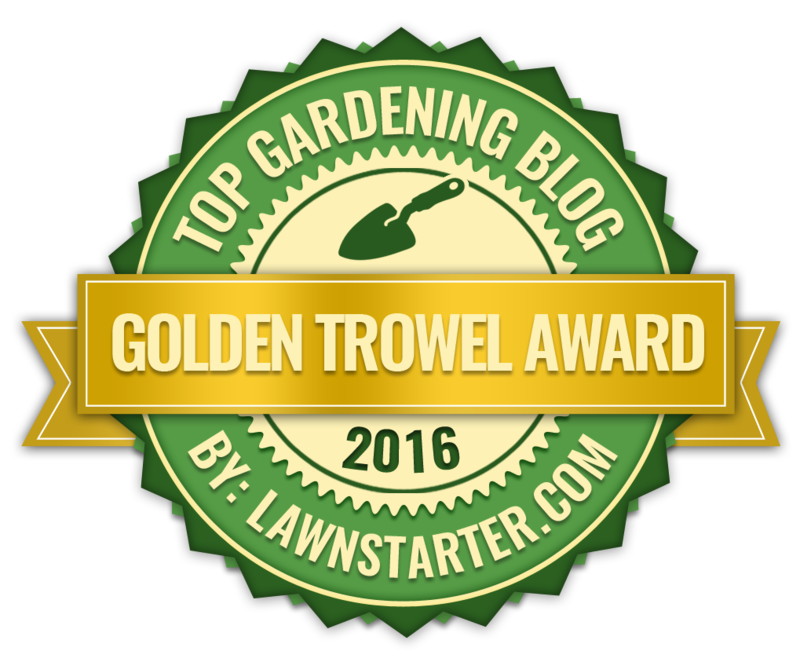 Some have good garden value while a lot are rather boring, but the reason there is such a large choice out there is because they are largely low maintenance, and tolerant of drought. 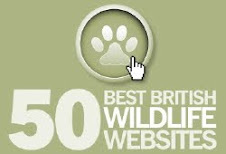 They are also very much in vogue with garden designers which has made them fashionable. However this is never a good thing and should be ignored when considering your own garden. Perhaps the most striking of all the ornamental grasses is Miscanthus sinensis var. condensatus 'Cosmopolitan'. It is a hardy, strong-growing herbaceous perennial grass noted for its bold green and outstanding pure-white/creamy variegation. The leaves are 18–75 cm long and 0.3–2 cm wide with pale green midribs. Miscanthus sinensis 'Cosmopolitan' also has compact, feathery purplish flower heads that emerge in late autumn. It has a clump-forming, arching habit and can reach a height of up to 3 metres although there are some report of it growing to 4 metres under favourable conditions. 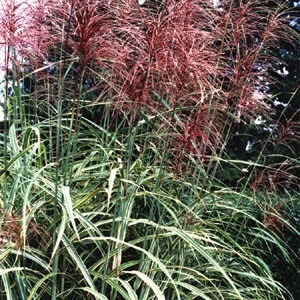 Despite its height Miscanthus sinensis 'Cosmopolitan' will not require any staking. 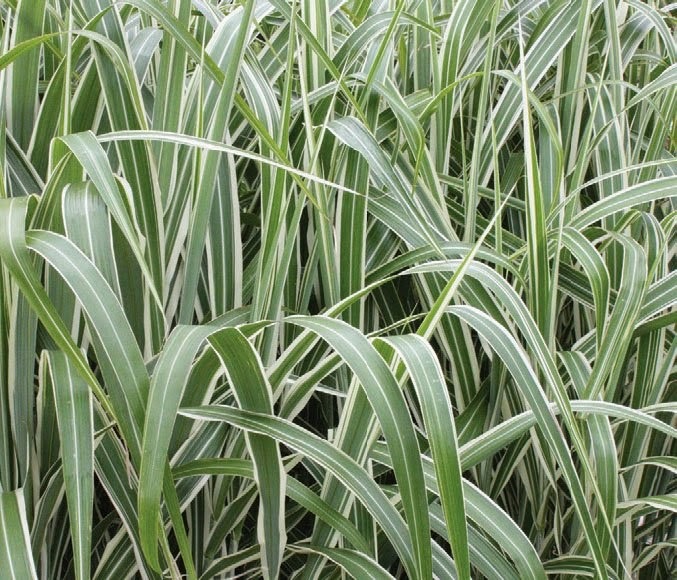 You can grow Miscanthus sinensis 'Cosmopolitan' in any moderately fertile, moist but well-drained soil in full sun. It may require additional watering in sandy or free draining soils, especially while the root systems establishes in its first growing season. The variegation will show at its best in full sun, but avoid shade as this can cause the plant to flop. Avoid over feeding with excessive fertilizer or organic mulches as the plant can again become floppy in late summer. The foliage does tend to turn yellowish after a hard frost, but this will quickly turn to straw-beige as it dies back for winter. 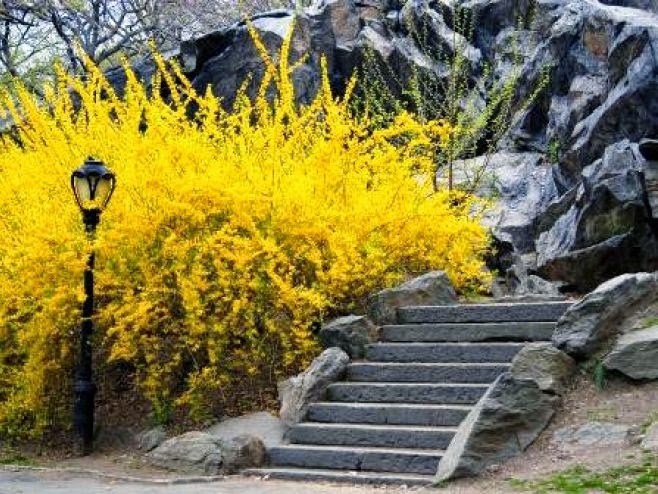 Allow the foliage to remain as long as the grass retains ornamental value but as soon as it becomes attractive cut it back to near ground level. Cutting back must be done by May as a matter of good practice so that the new growth can emerge in all its glory. Miscanthus sinensis var. condensatus 'Cosmopolitan' received its Award of Garden Merit from the Royal Horticultural Society in 2001. 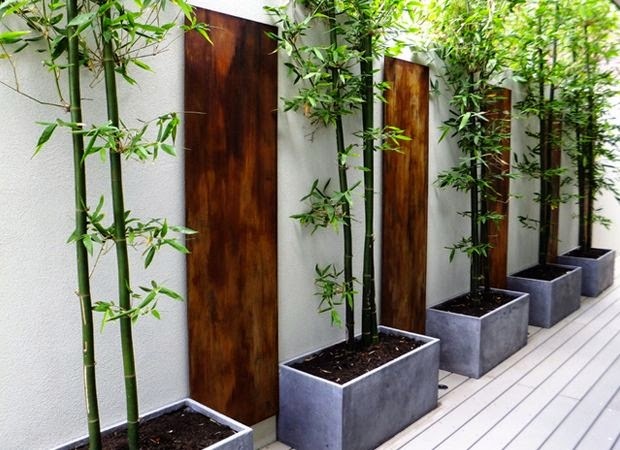 Bamboo are undoubtedly one of the most majestic of all ornamental foliage plants. However give them overly favorable conditions and they can quickly become an invasive pest and extremely difficult to eradicate. There is a solution. 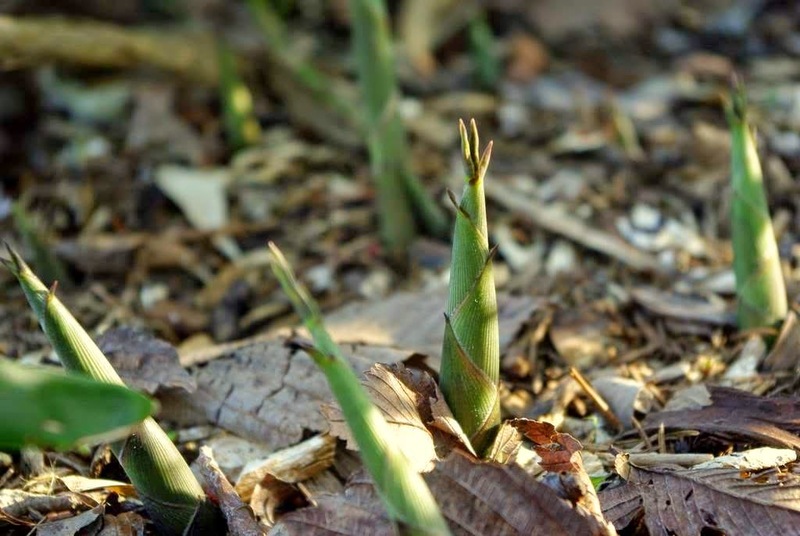 Rather than risk a lifetime of removing thumb-thick culms from your lawn, paths and herbaceous borders consider confining the root ball and growing your bamboo in a container. 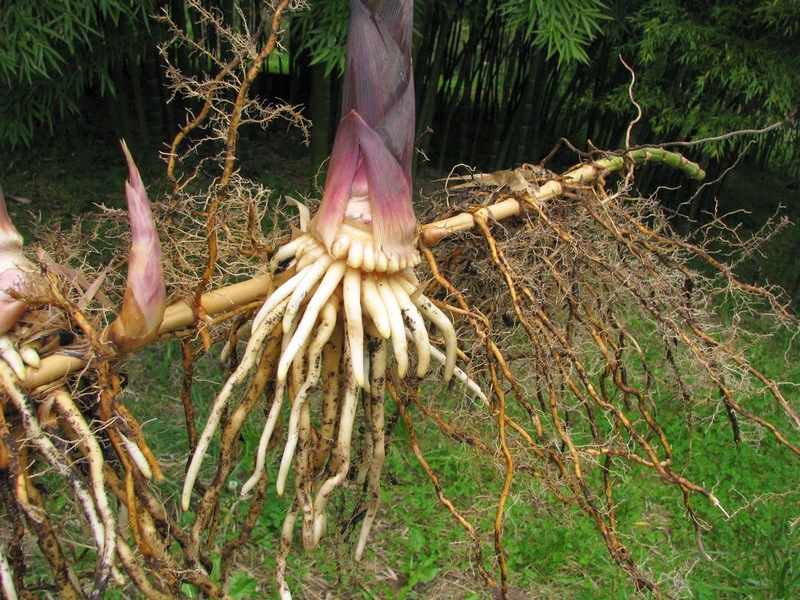 Be aware though that bamboos are vigorous plants and will become root-bound over time. 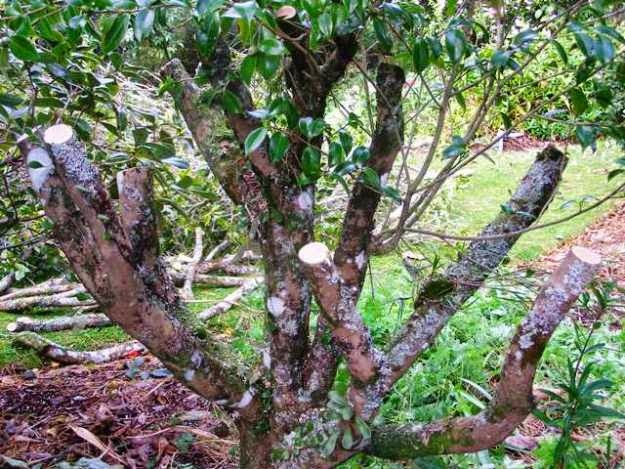 This will lead to weak growth, and sparse and discolored foliage due to nutrient deficiencies. This is resolved by either potting on into a larger pot or removing the bamboo to divide the root-stock and then replant one of the smaller sections back into its original pot. Pots with a body wider than its neck are unsuitable as you will not be able to remove pot bound root ball without breaking the pot. 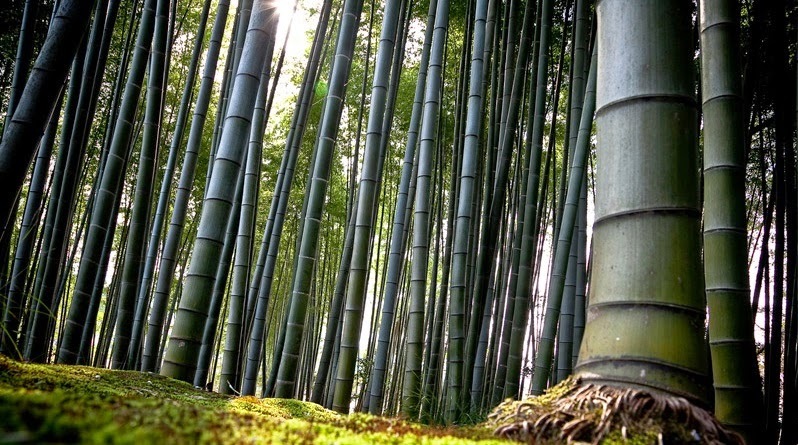 Bamboo are greedy feeders and during the summer will easily transpire huge amounts of water. With this in mind add controlled-release fertilizer pellets and water-retaining gel in the compost before planting. Water frequently over the growing period and feed with a liquid soluble fertilizer. During the height of the summer you may need to water daily. 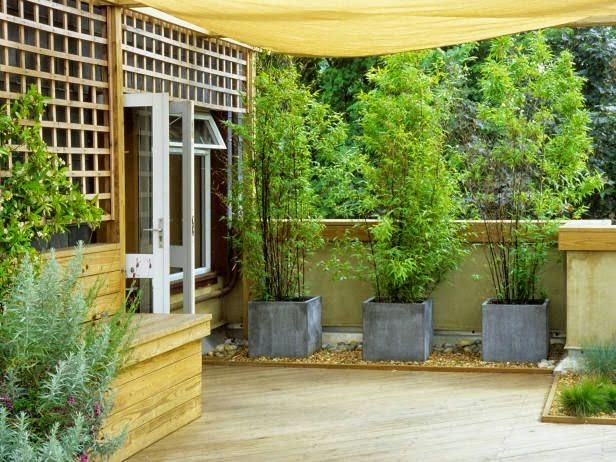 Avoid exposed, windy positions as this will lead to greater water loss as well as risking the bamboo from blowing over which can cause damage to itself and other plants, as well as break the pot. Reduce watering over the winter period but make sure the compost is kept at least moist. If the compost is allowed to dry out your bamboo can become stressed and drop its foliage.There is no need to feeding in the winter. In very cold weather, the roots can become damaged by freezing temperatures so either move the pot to a frost free position or insulate the containers with bubble wrap.